Now that I've seen Disraeli, I lack viewing only one of the five best picture nominees from 1929-30, the third year the Academy handed out Oscars. I doubt that The Love Parade will change my mind since the third best picture recipient, All Quiet on the Western Front, marks the first time that the Oscar for best picture went to a movie that still holds up today as a great film. However, we are here to discuss Disraeli, which won George Arliss best actor for his portrayal of the famed British prime minister. The movie is stiff and stagy and while Arliss' performance overflows with theatricality, he is the whole show here and really the only aspect of Disraeli that makes it remotely watchable today. Take that for what it's worth. Of his competition, I've only seen Wallace Beery in The Big House and that was many, many years ago, so I wouldn't trust my memory to try to compare the two performances other than to note I've seen many Beery performances and he was a fine movie actor whereas Arliss' work definitely shows the signs of someone who made his mark on the stage and in silents. In fact, perusing IMDb, Arliss had played Disraeli before in a silent film with the same title back in 1921. Both films told the same story and were based on a play by Louis N. Parker. So — and I hate to make this assumption without doing the requisite homework — the Academy nominated its first remake in its third year of its existence. Disraeli tells the story of the British prime minister's quest to secure rights to the Suez Canal in Egypt while fighting forces opposed to the idea at home and trying to beat Russia, who has its eyes on the same prize. Sounds like it could make an exciting story of political and international intrigue. Too bad it doesn't turn out that way. Directed by Alfred E. Green, Disraeli begins with a series of what could be called blackout sketches, detailing quick scenes elsewhere such as the House of Commons where Disraeli's Suez Canal idea goes down to defeat. After these few short scenes, the rest of the action purely resembles a play, taking place in the drawing room of Disraeli's home. With no government backing or, more importantly funding, to realize his plan to acquire the Suez, Disraeli hits upon a plan to finance the venture with private funds from the richest citizen he knows, Sir Hugh Myers (Ivan F. Simpson). He sends an envoy, the young Lord Charles Deeford (Anthony Bushell), who also is part of a burgeoning and unnecessary romantic subplot with Lady Clarissa (a very young Joan Bennett, still in her teens). Unfortunately, opponents to the plan sabotage Myers' wealth, making him bankrupt, after the plan has gone through, as one of those adversaries, Mrs. Travers (Doris Lloyd) comes to gloat at Disraeli, who upon her arrival first acts (or perhaps overacts might be a more appropriate word) that he's ailing) before he springs on her. It seems that a lot of the opposition to Myers (and to Disraeli, though not shown in the film) is that he's Jewish). Mrs. Travers and others constantly refer to him as "the Jew." However, Disraeli's skills manage to trick the Bank of England to give Myers a line of credit, saving the deal and delivering to Queen Victoria the additional title of Empress of India. Despite Arliss' tendency to play to the back row, he is the only reason to see the movie and, by reading reviews of the film from 1929, this was his first sound feature. Reading reviews from the time can be quite illuminating. Mourdaunt Hall writing for The New York Times gave the film a rave, though something in his lead disturbed me in his description of Disraeli (the historical figure, not the movie). 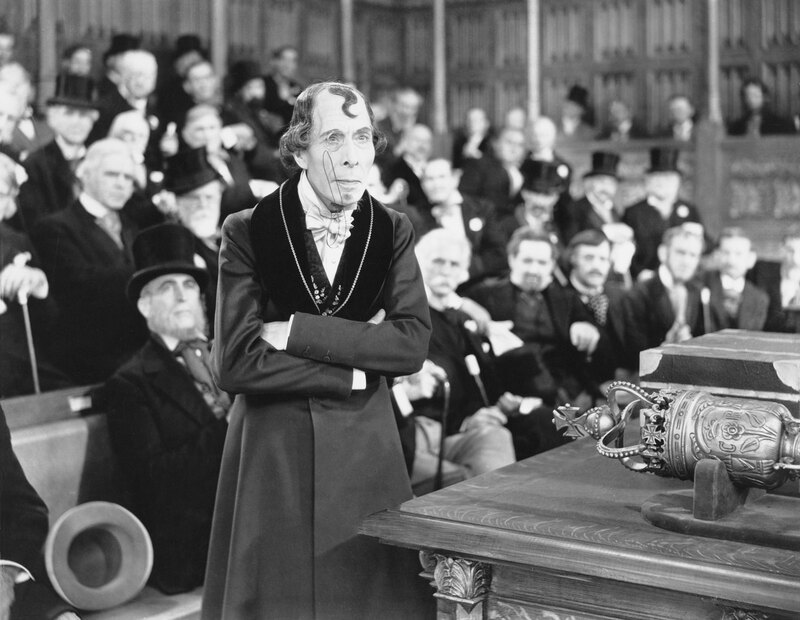 "It would have done old Louis Parker's heart good last night to hear and see George Arliss in the Vitaphone version of his play, Disraeli, which was offered to an appreciative audience at Warner's Theatre. For Mr. Arliss is on his mettle and he lends to the romantic conception of the great Jew an artistry and vigor that is a joy to behold." Now, I did not know these historical facts off the top of my head, so I looked them up, but Benjamin Disraeli was the first (and so far only) person of Jewish descent to serve as prime minister of England. His parents were both Jewish but when he was 12, his father had him baptized into the Anglican Church and he was a practicing Christian until his death, though much of the bile and hatred thrown at Disraeli throughout his career was anti-Semitic in nature. Still, for The Times to be referring to him as "the great Jew" decades after his death strikes me as odd, when his ancestry had nothing to do with his accomplishments. Gee, that sort of reminds me of a certain Christian president of ours that people keep tossing slurs at accusing him of being a secret Muslim. It's worth noting that Time magazine wasn't quite as bowled over by the film as The New York Times (mainly because in its capsule review, they seem to question why it was made) though they call it "exciting" and also emphasized that Disraeli was Jewish despite the fact that he practiced Christianity. "The efforts of a Jewish prime minister of England in 1875 to buy a public utility for his kingdom have been made into a picture as exciting as a detective story. This is odd but it is odder still that, although Louis Parker's old play is no more than effective theatrical plum pudding, it should seem at times almost literary." What difference did it make so many decades after his service that 20th century U.S. publications felt it necessary to emphasize that Disraeli was born a Jew. I doubt they referred to any other British prime minister as "the Christian prime minister of England." I know we live (in theory) in a time where such labels aren't viewed as significant by people who judge politicians on their actions, not their religions or ethnicity, but still, it's alarming even if the references are passing and not necessarily negative. It's just that they weren't necessary at all by 1929. Of course, 1929 wasn't just a new time for talking motion pictures, it also was a new time for film criticism and a Mourdaunt Hall didn't have the decades' worth of filmmaking classics and acting tour de forces with which to compare Disraeli that critics that have come since do. Perhaps they didn't think it would be fair to say that Disraeli didn't live up to the best of the silents. I'm not in that position. Be it talkie, or be it silent, literally thousands of films have been made that exceed Disraeli in greatness.